Chefs check the temperature on a recent dish to ensure the proper cooking temperature on the new Middleby Marshall CTX electric conveyor ovens. Gulf Power helped Capt. Anderson’s convert to the new electric ovens that enable the restaurant to continue to provide excellent, consistent food and superior service to customers while reducing kitchen labor and food waste. Tourists from all around the country, as well as many locals, flock to one of Panama City Beach’s favorite seafood restaurants. Only open nine months out of the year, Capt. Anderson’s serves more than 250,000 guests each season, serving more fresh, local seafood than any other restaurant in Florida. A staple on the beach since 1967, it’s no wonder they’ve been named among America’s Top 50 restaurants, recipient of Southern Living magazine’s “Best Seafood Restaurant” Florida Trend’s Golden Spoon Award for 15 years, and inducted into the Restaurant Hall of Fame in 2005. The standards are high and to help prepare meals in the style and tradition customers expect, while saving the restaurant money, Gulf Power has helped Capt. Anderson’s install a kitchen of the future with innovative equipment that automates the cooking process. That’s when Patronis turned to the commercial energy experts at Gulf Power. The energy consultants at Gulf Power suggested installing the Middleby Marshall CTX electric conveyor ovens, the leading ovens in kitchen automation. The new cooking systems enable their restaurants to provide excellent, consistent food and superior service to customers while reducing kitchen labor and food waste. Now in their second season of use, Patronis said the cooking staff are keeping cool in the kitchen with the triple-stack ovens while reducing cooking times by at least 30 percent. 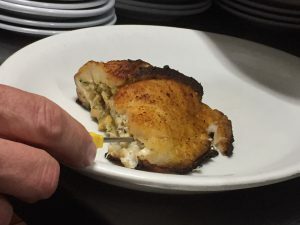 “Since introducing these ovens to the restaurant, our cooks are able to serve our customers quicker while reducing both the footprint in the kitchen for more room to operate in and keeping it cooler for our staff’s comfort,” said Patronis. But installing new electric ovens was not the only way Gulf Power helped Capt. Anderson’s lower their energy cost. Gulf Power has also helped the restaurant light their way to major energy savings by installing new LED lighting. Old incandescent bulbs are based on technology that is 130 years old, a light source that converts most of the bulbs energy into heat. Businesses, such as Capt. Anderson’s that have made the conversion to LEDs, have been able to save money on the energy usage for lighting by as much as 80 percent. Installing the new lights both inside and out, the LEDs will last longer than traditional bulbs, require less maintenance, and operate at a cooler temperature, reducing the demand on the cooling system. “Switching to LED – Light Emitting Diode – lighting is the quickest and simplest action any business can take to reduce energy usage,” said DelaHaya. Speaking of heat removal, the restaurant has also upgraded the efficiency of their HVAC systems, and retrofitted the roof to employ Cool Roof Technology, a roof that is designed to reflect more sunlight and absorb less heat than a standard roof. Click here for more information on energy incentives and programs.